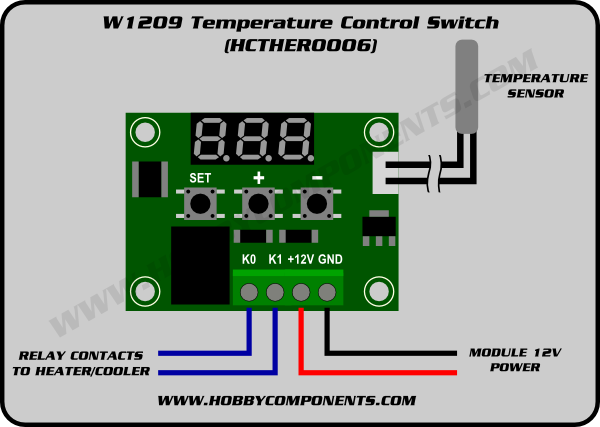 The W1209 is an incredibly low cost yet highly functional thermostat controller. With this module (HCTHER0006) you can intelligently control power to most types of electrical device based on the temperature sensed by the included high accuracy NTC temperature sensor. Although this module has an embedded microcontroller no programming knowledge is required. 3 tactile switches allow for configuring various parameters including on & off trigger temperatures. The on board relay can switch up to a maximum of 240V AC at 5A or 14V DC at 10A. The current temperature is displayed in degrees Centigrade via its 3 digit seven segment display and the current relay state by an on board LED. The thermostat will display the current temperature in oC by default. When in any other mode making no input for approximately 5 seconds will cause the thermostat to return to this default display. To set any parameter first long press the 'SET' button for at least 5 seconds. The seven segment display should now display 'P0'. This represents parameter P0. Pressing the '+' or '-' buttons will cycle though the various parameters (P0 to P6). Pressing the 'SET' button whilst any of there parameters are displayed will allow you to change the value for that parameter using the '+' and '-' buttons (see below). When finished setting a parameter press the set button to exit that option. If no buttons are pressed for approximately 5 seconds the thermostat will exit the parameter options and will return back to the default temperature display. The parameter P0 has two settings, C and H. When set to C (default) the relay will energise when the temperature is reached. Use this setting if connecting to an air-conditioning system. When set to H the relay will de-energise when the temperature is reached. Use this setting if controlling a heating device. This sets how much change in temperature must occur before the relay will change state. For example if set to the default 2oC and the the trigger temperature has been set to 25oC, it will not de-energise until the temperature falls back below below 23oC. Setting this hysteresis helps stop the thermostat from continually triggering when the temperature drifts around the trip temperature. This parameter limits the maximum trigger temperature that can be set. It can be used as a safety to stop an excessively high trigger temperature from accidentally being set by the user. This parameter limits the minimum trigger temperature that can be set. It can be used as a safety to stop an excessively low trigger temperature from accidentally being set by the user. Should you find there is a difference between the displayed temperature and the actual temperature (for instance if the temperature probe is on a long run of cable) you can make minor corrections to the temperature reading with this parameter. This parameter allows for delaying switching of the relay when the trigger temperature has be reached. The parameter can be set in one minute increments up to a maximum of 10 minutes. Setting a value for this parameter will cause the relay to switch off when the the temperature reaches this setting. The seven segment display will also show '---' to indicate an alarm condition. The relay will not re-energise until the temperature falls below this value. The default setting is OFF. Reset to default is actually done by holding + and - and then powering up. This module is super value and functional. Even better is the STmicroelectronics microcontroller STM8S003F3P6 is wide open and can be programmed as a development system in C, asm and even FORTH! Caveat emptor, though, for warranty purposes. Having worked with the Intel 4004 in the early 70s, if I were to start over I would buy the W1209 and launch myself into the future, once again. Enjoy. Barewires, the GitHub repo you mention gives the temperature control switch board a command line, that's quite surprising! It looks like a programmer and a serial interface adapter are required. Is there something you can recommend? I have traced the 4 pin header from top to bottom, located to the left of the LED. Pin 4 is the GND at the board edge. Pin 1 goes to +5.0 Vdc. Designated as square pad. The external 12 v screw terminal power feeds a diode drop D2 and the AMS1117-5.0 5 volt regulator. If external 12 volt power is used - do not connect Pin 1. I confirmed that back-powering the W1209 alone from the Programmer 5 volt pin is safe and the temperature works normally. I have tried reading the flash but get all 71H, maybe due to program protection. Check out this enhanced product and data for a newer/larger STM8 microcontroller of a similar series. Last edited by barewires on Mon May 22, 2017 10:52 am, edited 4 times in total. Hi Barewires, thanks a lot for links and hints! I guess that I'll give it a try. \ To stop it type 0 BG ! Forth seems to be simple but multitasking on a 8bit micro with a console is a surprise! Hi Alfredo and all, I have had much success with eForth on the STM8S103F3 - see HCDVBD0034 forum. Last edited by barewires on Wed May 31, 2017 9:44 pm, edited 1 time in total. Finally I have programmed the W1209 with the eForth OS. The factory code is protected and cannot be read or written to unless it is unlocked. Checkout the HCDVBD0034 forum for details on installing the stm8flash burning utility. .ihx is in Intel Hex format and can be viewed with less W1209.ihx scroll up/dn, q to quit. Less is better than More as in cat W1209.ihx | more space to advance a page only to fall through the end. prints lines, words, and byte counts man wc for help file. There are two ascii characters per byte. It is typical that the 4 wire SWIM interface is never 1:1, always verify the positions of the signals. Equally important is Vdd which is detirmined by looking at the voltage regulator part number, often on the back side. 5.0 or 3.3 volts? The W1209 has an AMS1117-5.0 which is powered from 12v external and other boards are running on 5 volts regulated down to 3.3 v. It is usually safe to program by backfeeding at the rated voltage, but be warned. On a Pi 3 or Pi Zero W: note the W1209 blaster part designation stm8s003?3 and the question mark and the dash small letter L for list below. In a few seconds the LED should display 4th meaning eForth is running - celebrate now! but when you sober up you will realise that the temperature and thermostat code is gone! but that tends to happen when one installs a new program over the existing. So start reverse engineering and build a new eForth system. - to be continued as I have not yet had success with the W1209 serial communications. Sorry for the image quality, it is difficult to get the multiplexed LED segments. Last edited by barewires on Sat Jun 03, 2017 1:22 pm, edited 3 times in total. Of course, some kind of UI is needed, e.g. for setting thresholds. Judging from the code examples that shouldn't be hard. Hi Alfredo, I tried picocom a few days ago but lost the link to the page with the configuration settings or 'wrapper', thanks for reminding me. The sudo is initially included here as it will be required the next time one edits the shell .sh file or else the changes will not be accepted. It can be very frustrating creating a shell file, changing to executable +x and then making lots of changes that don't save. Now the carriage return / line feed works normally in interactive mode (still missing when in NVM / RAM entry mode?) with CR being generated locally by picocom on the STM8S dev boards. in picocom, 'S' for send file. The -c is character delay and -l is line delay to allow eForth time to compile the words. I will later investigate why the terminal runs only at 9600 baud. As I have the MINDEV source code it is worth learning. If you want to save the new words in Flash then type NVM for Non Volatile Memory. First type FILE to go into file transfer mode. The eForth command FILE puts the system into a mode that does not echo back nor sends out error messages and HAND goes back to interactive mode. This is used to best transfer files. Now type HAND to go back into interactive mode. Turn off NVM by typing RAM. I have yet to get a working terminal with the W1209 board, so the contents of these posts mostly applies to parallel eForth threads now working on other HC STM8S board series. Updating the forum accurately and sharing information is more labour intensive than actually doing it. Still need to see if a diode is needed when using the SWIM pin as a half-duplex link on the W1209. Last edited by barewires on Mon Jun 19, 2017 4:05 pm, edited 13 times in total. Also running gforth on the Pi, it is a full Forth with 1763 words. //copy and paste the list of words with editing to a file gforthwords. (Raspbian / Linux does not care about file extensions (it's all in the permissions) so this file can be viewed with less gforthwords. 1763 vs 162 eForthwords. Of course the 8K / 1K STM8S is punching above its weight with my Pi Zero W at 16 GB / 512M and a 250 GB PiDrive. One enhanced command is see, an ARM disassembler, see DROP or any other word. This word is far to complex to put in a small micro. A great way to learn how words are written.